The settings of common browsers may be adjusted to not accept cookies. Note: We cannot guarantee that you will be able to make unlimited use of the features of this website when you change the settings of your browser accordingly. Handball needs quick and correct decisions in each game situation. This can be trained playfully and diversely through handball-specific games. 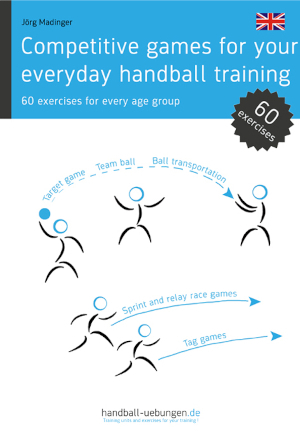 These 60 exercises are divided into seven categories and train the playing skills. The exercises are illustrated and described in an easy, comprehensible manner. They can be immediately integrated in every training unit. Various difficulty levels, additional notes, and possible variations allow for adjustment to each age group and group size. This reference book contains 60 individual exercises.